Fennel Braised Short Ribs over Mushroom and Pea Risotto – Don't Forget the Cream! This is easily my favorite dish to make when I’m serving guests. Universally loved, endlessly versatile and just as good if made ahead, there is no downside to this meal. It is at once hardy and elegant. Its presentation is impressive. The beef is so tender you do not need a steak knife, the sauce is complex, the creaminess of the risotto hold up to the strength of the beef. And best of all, braising the short ribs is much more a matter of technique than exact flavor ingredients so the dish is easy to customize to your favorite flavor profile. This recipe uses fennel, but rosemary or chili are also a great options. While an easy dish to make, it is important to not cut corners with the preparation or the cuts of meat. It is little time-consuming, but all of the steps can be done the day before you want to serve the meal, (arguably the better alternative!) giving you more planning options. Everyone must have a good butcher, sometimes this can be found at your local grocery store, some folks are lucky enough to have a true butcher shop where your butcher knows you and will cut meat to your requests and sometimes, the super-fortunate, live in farm country and know a farmer with truly exceptional stock; raised and butchered humanely. I’m lucky like that. We live in farm country. Your short ribs should be boneless and at least 3-4″ thick. Always always try to buy your cuts of meat that are fairly uniform in size. If you cook a 4″ short rib along with a 2″ rib, the smaller one will overcook and become dryer than it should be in the time it takes to fully cook the larger rib. This holds true for all meat. So, insist on uniform sizes. On average, I prepare 1 1/2 boneless short ribs per person. (At 3-4″ thick each). Also see the related post on how to make Risotto. 1. Heat a large dutch oven over medium low heat. Once warm, toss in your spices and let them toast for 4-5 minutes or until they make your kitchen smell delicious. When you smell them, they are done. Remove from the dutch oven and place in a bowl. 2. Dry your short ribs with a paper towel, extra moisture is not your friend at this point. Once dried, rub the toasted spice on both sides of the cut and sprinkle with cracked black pepper and salt. 3. With the same dutch oven, turn up the heat to medium-high and sear the meat on all sides, about 6 minutes per side, but use common sense and adjust this according to the size of the cut. Do not crowd the meat, do this in batches until all the meat is done. Do not worry if the meat cools while you do batches, it will not matter as we will be braising it also. Pour any oil and grease out of the pan. Do not wipe or remove the bits stuck to the bottom. They are your flavor nuggets. Say something nice to them and continue on. 4. When all the meat is seared, and hopefully there are little bits stuck the the bottom of your dutch oven, it is time to make your braising liquid. Working quickly, add your wine to the pot and scrape the little bits off of the bottom. Reduce by about 1/3. 5. Add the Balsamic vinegar, allow to reduce by half again. 6. Add the tomato paste and swirl to combine. Don’t worry if it isn’t completely combined. 7. Place your ribs back into the pot, hopefully in a single layer. Place the ribs on their sides to make room if need be. 8. Add the chicken stock, orange juice, tomatoes and fennel. Be sure the liquid covers the meat. If it doesn’t, add more liquid (stock, wine, juice…whatever). Bring to a boil. 9. When it hits a boil, THIS IS IMPORTANT – fully wet a large piece (or two) of parchment paper. Place the parchment over the meat and liquid, put the lid on the dutch oven, and place in the oven for 2 1/2 – 3 hours. 10. Remove from the oven and let rest for 30 minutes. 11. You can serve as is (the pictured dish was served at this point), or remove the meat and cover with foil then bring the liquid to a boil and reduce to to thicken the sauce. Of course, if you make this dish ahead of time, refrigerate the juice and remove the solidified grease first. because the ribs are seared, much of the grease is removed early in the process. 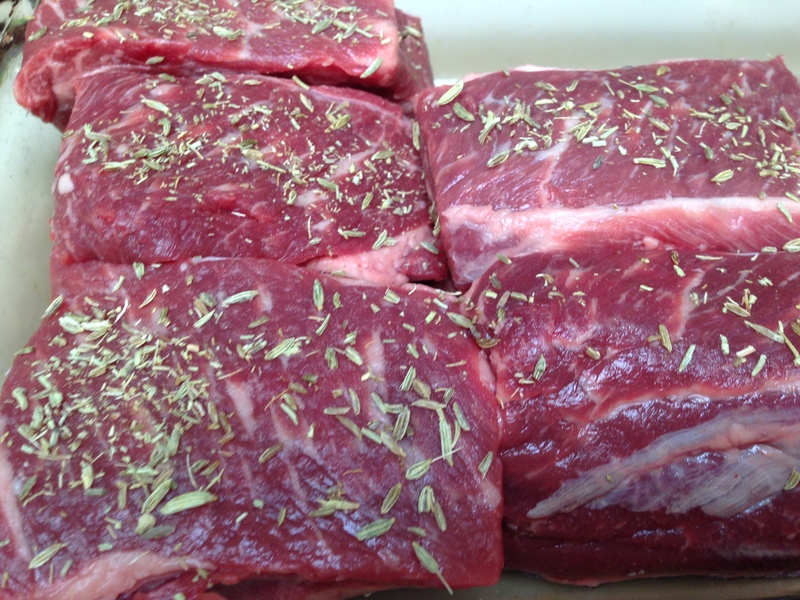 But the meat will continue to render fat when being braised (which is why we do this!). 12. I served this over a creamy risotto with peas as pictured, but it is great with smashed potatoes. Now, with all recipes, you can adjust flavors to your liking. I also follow this technique using chili garlic paste instead of the tomato paste and soy sauce instead of balsamic. Have fun with it and send me pictures of your creations. Pingback: Risotto, creamy, soul-soothing, risotto – Don't Forget the Cream! Previous Previous post: Bacon Jam Bacon Jam, Life is better with Bacon Jam.